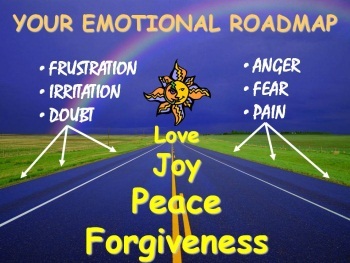 Dr. DeFoore's Healing Anger Newsletter entitled "Your Emotional Road Map"
Hi, learn how to follow your emotional road map to happiness. How Does The Emotional Road Map Work? Three new web pages--check them out! Here are the web pages I have built. There are three of them, and the titles tell you what they're about. Anger Management Skills For You and Your Loved Ones, What Kind of Anger Problems Do You Have?, How To Create Personal Boundaries. We now have three interactive online tests, one to find out if you have an anger problem, one to assess your escalation patterns, and one to measure your depression level. Check Out The New Look On Our Facebook Page! It gives you all of the latest updates from Dr. DeFoore and visitors like you. To follow us on Facebook, just go to Anger Management Resource by Dr. William DeFoore and click on "Like" at the top of the page--or, follow us on Twitter! Visit Goodfinding.com, Dr. DeFoore's other web site. Find lots of positive, upbeat perspectives to help you with your anger management, and sign up for the Goodfinding Newsletter. Anger often comes from keeping a very negative focus--and here's your antidote! I hope you find comfort in the idea that there is a type of guidance system within you, that will help you get from where you don't want to be to where you want to be. It's made up of your emotions. Your negative emotions let you know you're off track, and your positive emotions tell you that you're getting it, in the groove, and going exactly where you want to be. Your current thoughts and actions are triggering specific emotions inside you. Pay attention, notice what you're feeling. You take action (and change your thoughts) to get yourself feeling better, and slowly work yourself back in line with who you are and what you want. You slowly but surely get better and better at generating positive emotions such as satisfaction, comfort, confidence and love. As a result, you get more and more in touch with the good person you truly are, and your positive emotions grow and grow until they become normal for you. That's how the "road map" works. The negative emotions are like those bumpy things on the side of the highway, letting you know that you're drifing out of your lane. When you pay attention, you get more and more skilled at changing your thoughts and actions, which generates more positive emotions, telling you that you're back on track. That's the real question, isn't it? We've all gotten to a good place in our lives, but the challenging part is staying there. 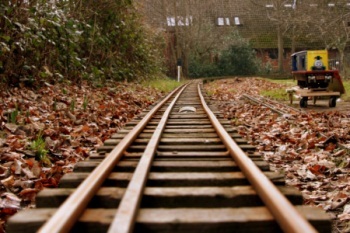 If you feel like you're way off track, then you need to deal with your pain, fear and anger first, so that you can start feeling better. Take the anger test, and follow the instructions at the end. Also, use these exercises to understand and heal your anger. Start looking around you for all of the little things that are good, right and working. Count your blessings. Keep a gratitude journal to "tune up" your positive attitude, and to begin forming an "attitude of gratitude." Make a list of the things you appreciate about your spouse, your children and other significant family members, and then share your list with them. Have fun with this, and remember to do it for you, no matter how they respond. To keep this going, and to stay on track for the rest of your life, do the Goodfinding journaling process. Think of this like taking a shower, brushing your teeth, exercising, and paying bills. Practice it for at least 30 days, to develop the habit, and then just keep going. You can do this! The "track" you're trying to stay on here is just feeling good, most of the time. You were designed to feel good. When you are feeling good and having a good time, you are smarter, kinder and healthier. As a matter of fact, feeling good and having a good time is the most important thing in your life, as long as it doesn't hurt anyone else. This audio CD program, also available for download as an MP3 file to play on your computer, iPod or other MP3 player will take you through all of the steps to become a full time Goodfinder!